The women in the stories in Out of Cleveland face their challenges with an uncommon blend of intelligence, scepticism, and hope. Each story shows the entanglement of cause and effect, creating a memorable collection of unique voices. In "Ninety East" a truck driver and a woman in a Mustang perform an unlikely romantic duet in stream of consciousness as she follows him through a snowstorm from Cleveland to Buffalo. "Poison" is less a whodunit than a was-anything-done: after a woman takes in an inscrutable foreign researcher as a boarder, she suspects the worst. "Body Image" is a humorous feminist coming-of-maturity fable, while "Mysterious Infestations" is a symbolic tale that dramatizes the psychology of shame and its escalation, in the tradition of Kafka. 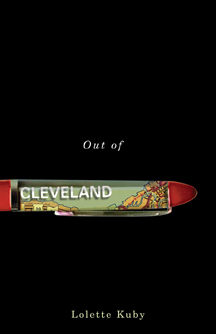 Out of Cleveland is a most extraordinary potpourri of voice, texture, and mood. Out of Cleveland is Lolette Kuby's first collection of short stories. Capable of both humorous self-deprecation and bitter sarcasm, Kuby's heroines pursue the truth with a resilient curiosity. 160 pp 5.5" x 8.5"